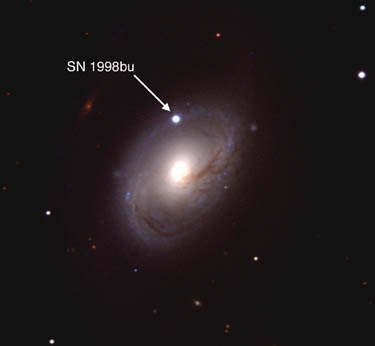 This page is devoted to information on Supernova 1998bu in M96 Basic information on this SN, including the last reported brightness, on this Supernova can be found on the main page. Information on the original web pages for many of these images can be found on the Supernova links web page. 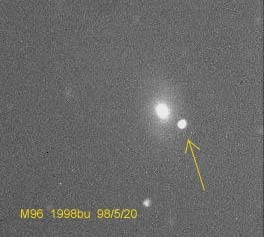 It took less than 24 hours for me to accumulate enough images of SN 1998bu in M96 to run out of space on the main page. 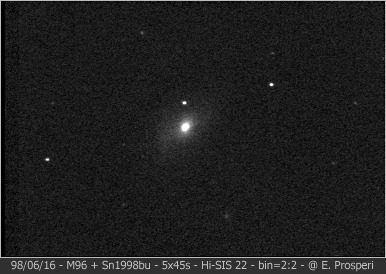 This was the first bright SN to be found in a Messier galaxy since SN 1993J in M81. At this point it is the brightest SN to be found in the year 1998. Discovered soon after 1998S and 1998aq it rounded out a rather fantastic spring for SN hunters. We have a DSS Photometry reference image made by Odd Trondal. Icon created from Nick Suntzeff's image. ISN has a SN 1998bu web page to report your observation on. Optical Light Curve of the Type Ia Supernova 1998bu in M96 and the Supernova Calibration of the Hubble Constant by Nicholas B. Suntzeff et.el. D. Hanzl image 5/10/98 Dead link? Rudolf Novak image 5/11/98? Dead link? Marko Moilanen image 5/12/1998 23.20 UT with Accumulate exposure (30x40s), red filter, dark and flat corrected, temp -18c. Rich Jacobs image 5/15/98 Dead link? M.Peyro, J-P. Barilliot image 5/17/98 Dead link? This color image was made with BVI data taken on 27 May 1998 with the CTIO 0.9m telescope. Nicholas B. Suntzeff Used by permission. 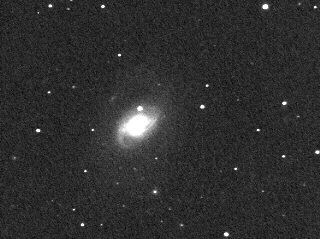 Mirko Villi, Italian supernova hunter and webmaster of the ISN, has found his third supernova in NGC 3368 = M96. 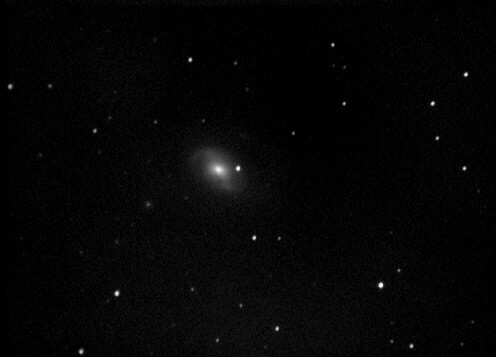 The supernova was found from his recently finished observatory near Forli', with a 25cm + CCD. 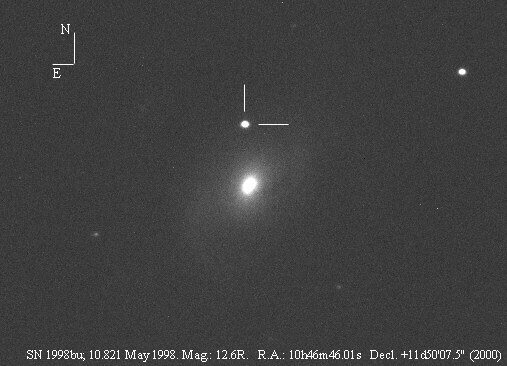 SN 1998 bu is 1' north of the nucleus and at discovery was around magn. 13, on May 9.9UT. Observations from Brian Skiff, who was the first to confirm the presence of the new object, and S. Nakano indicate a possible brightening, with V=12.3 No spectrum has been taken yet. Steve Lucas calculates that in theory the supernova could still brighten to magn. 10.9 (if of type Ia). If of type II it could have peaked already. The supernova is well placed for observations after sunset. The moon will leave in a few days. We will set up a dedicated page for this supernova as soon as possible. In the meantime check ../isn/suspect.htm for an image with some comparison magnitudes. M96 has a Brian-Thompson chart too. Congratulations to Mirko and all people involved in the confirming process. Further details on IAUC 6899 and soon on the ISN pages. A light curve and an "eyeball" analysis of the bright supernova in M96 (NGC 3368), discovered by amateur SN hunter and co-webmaster of the International Supernovae Network (hereafter ISN) Mirko Villi is presented. The magnitude estimates were gleaned from the supernovae chat and alert forums of the VSNET (variable star network/Japan), and the ISN (International Supernovae Network/Italy). Worldwide magnitude estimations assisted in making this amateur (professional?) endeavor a meaningful one involving a very serendipitious event. The light curve is an assemblage of submissions of the event's rise and decay in the R, V, and Visual band. Visual observational estimates were compared to sequencing provided by M.Funada (ISN) and Brian Skiff (Lowell Observatory) [see vsnet alert message #1756], plus sequencing was available utilizing the Thompson/Bryan SN Charts(1989) . All in all their were ~127 data points that were used, which were binned into 0.5 day averages. This event presented some interesting rise and decay trends which are evident in the submitted light curve. SN1998bu appears to be more rapid and sub-luminous in the visual, V and R-band than mean averages and theorized estimates indicate. An analysis and comparison data are discussed. key words: supernova, amateur (professional?) observations, light curve, analysis. NGC 3368 is an Sab(s)II type galaxy, and is a member of the "M96 Group which is a major condensation of the Leo I Cloud; it is centered on a dense core (3 degrees X 1.5 degrees). 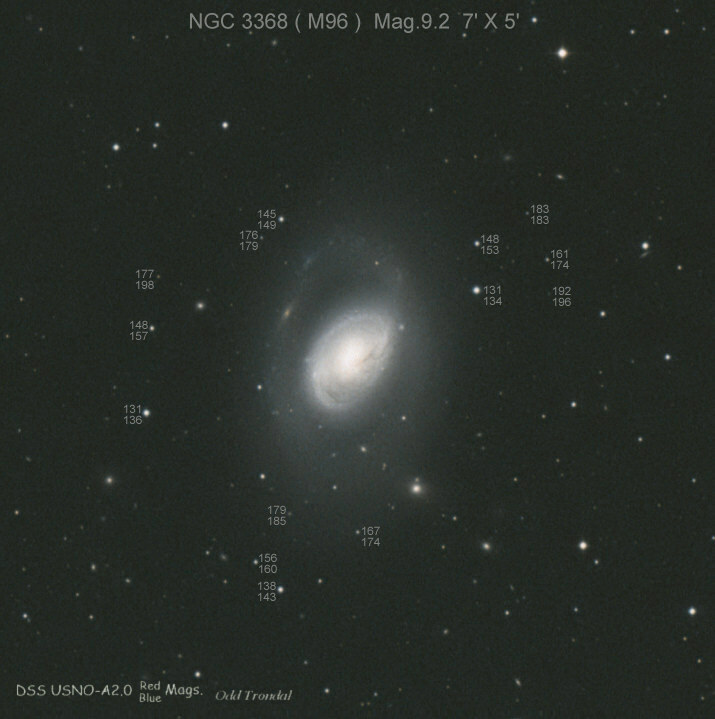 As the nearest of the well-mixed groups (types of galaxies), the M96 group is one of the best fields for the calibration of distance indicators applicable to E and L systems (N3377 and 3379), which are rich in globular clusters"(1). Residing at 10h 46m 45.2s, +11d 49' 16"( epoch 2000) this galaxy has an apparent blue magnitude of 9.49. Combining this with an absolute magnitude of -21.41 this entity then has a theorized distance modulus of 30.9, which yields an estimated distance of 15.13 Mpc(H/59km/s/Mpc)(2). A Type Ia SNe at this distance theoretically should diplay a maximum brightness (if -19.8 SNe absolute brightness is inferred) of 11.1. The observed magnitude brightness of this event was ~11.7v. Supernova 1998bu was a truly serendipitious discovery by Mirko Villi of Forli', Italy. He was testing out a new CCD camera in the light of an almost full moon and came across the then suspect star on May 9.9, 1998. A note went out to the supernovae community (IAUC#6899) shortly thereafter, and a call for verification was requested via the ISN and VSNET alert forums. SN 1998bu was located 1' north of the nucleus with a discovered magnitude of 13.5. Visual confirmation was made by B. Skiff, at Lowell observatory on May 10.33 UT at 12.5v (or possibly brighter considering local sky conditions). Days later the suspect had an identity...SN 1998bu. 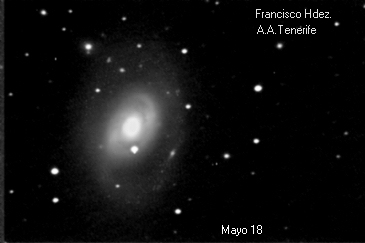 It might also be noted that there was a pre-discovery image of this galaxy taken on 3/3 which would indicate that this event was fainter than ~16.5. Viewing the light curve (which has a tendancy to appear flatter than most published light curves due to the 1:1 ratio used for magnitude verses epoch data, has been favored [by this author] to obtain a more difinitve and detailed presentation of the available information), we can see that the events pre-maximum slope is somewhat more rapid than the average mean visual rise curve (3) from the onset. However the visual observations then fall into the mean curve trend about 0.5 magnitudes BELOW visual maximum light (~5/21), and follow this slope for the first 8.3 days AFTER maximum light. The visual observations then fall away from the mean average from that point onward to a more fainter posture. This visually noted trend from the mean seems to indicate a much more rapid decline than the mean and could indicate a sub-luminous scenario for this event(Pskovskii-Branch effect). In a note sent to the VSNET and ISN chat forums, Dr. Hitoshi Yamaoka points out that: "As noticed in IAUC# 6902, the SN is affected by reddening in both the host galaxy and our Galaxy to an estimated A_V ~ 0.6 magnitude". Could this be one of the reasons for the sub-luminous nature of this event, visually? Maximum light estimates in the V-band were at (5/19) and R-band at 5/16) respectively. In type Ia SNe a V-band decline decay parameter was initiated in 1993 by M.M. Phillips (4) known as: delta m[subset] 20 V. Which is the decay magnitude of a Type I event at 20 days after maximum light (another parameter of delta m [subset] 60 V is also used for determining the brightness of the linear tail after the events inflection point). I will list some referenced V/20(m) parameters. In addition I am experimenting with a decay parameter for visual observers that will also use the decay decline for 20 days and will be noted as: v/20(m).It is the hope of this author to use this excercise to obtain a useful parameter which can be used by visual observers of bright type I SNe and for any subsequent research associated therein. (Note: this is just an experiment and time will determine if indeed this parameter can be useful to the visual observer).Table 1 is an example of the V/20 used in association with a small sub-sample (5) which includes an estimation of this event from the light curve along with the new v/20(m) parameter. * This estimate was gleaned from a light curve created by this author(available upon request). ** This estimate was applied utilizing an eye measurement involved in the general decay trend of visual observations for this event. It can be seen in table 1 that theoretically this event was a much faster visual decliner than SN 1991T. And once again, much more data is required to see if this parameter will be of any use. Considering that there was limited information in the V-band. An attempt has been made to compare these to mean V-band averages (6). V-band maximum appears to lagged behind the visual maximum by ~1.8 days. The trend from maximum light versus the mean average V curve appears to be slightly fainter than average (but not as drastic as the visual). The data and mean would seem to converge about the 30 day epoch. Below (Table 1a) are statistics reflecting the differance (by eye). In the R-band some differances occur for this event as compared to templetes for type Ia SNe (7). Table II infers an R-band Max. 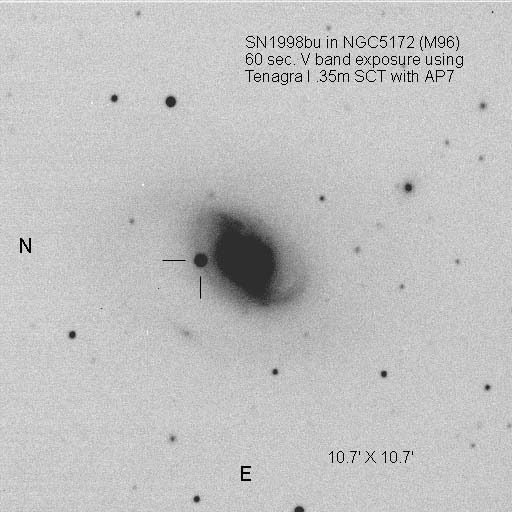 of 11.96 on 6/16/98 for SN 1998bu (averaged). As a disclaimer I must caution that the R-band data templete (7) was selected from a limited sub-sample of events. It can be seen that the R-band photometry for this event indicates a faster decline speed as compared to the mean average templete before, and after maximum light to well before day 16. A secondary hump (or plateau) is evidenced on the light curve, which agrees nicely with what occurs on the referenced templete data at about this epoch. This infers some similarities along with the visual and V-band data trend of a "fast decliner". One other note: In the templete by (7), the R-band appears to be brighter than the V-band decay slope, where in the case of this event (the SN 1998bu light curve) it does not? It is more faint! Also the 2.4 day lag behind Vmax for Rmax is a bit less than templete indications (7). With the limited time that this event (SN1998bu) was monitored by the supernovae community some interesting results are evidenced (all in all). 1.) The visual trend indicates a much fainter and rapid posture than the mean average. 2.) V-band photometry indicates a more rapid rise and (slight) decay decline than the mean average. 3.) R-band photometry indicates a much faster rise and decline posture than a mean average templete, this corresponds also with what occurs in the visual and V-band mode. 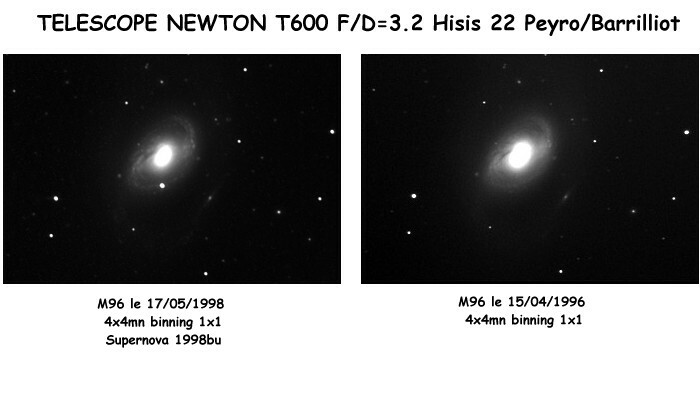 A nearly similiar decline scenario as SN 1994 is closely inferred. Why does the visual, V-band and R-band estimates indicate such a fainter posture from the mean averages? Is the absorption of this event along our line of sight a factor (0.6m)? Is a color-related involvment regarding this SN a primary consideration, that needs to be accessed in the future? Or is this event to be regarded as a peculiar type Ia SN? These questions will remain unanswered until professional data is presented and many more events are monitored to help determine a difinitive pattern to other events. Many thanks to all individuals who contributed to this event in the form of visual, V, and R-band photometry. 1.) Galaxies and the Universe, Vol. 9 of Stars and Stellar Systems; Kuiper (1975). 2.) A Revised Shapley-Ames Catalog of Bright Galaxies; Sandage and Tammann(1981). 3.) Doggett and Branch; AJ _90_,(11), November (1985). 4.) M.M. Phillips; ApJ,_413_,L105 (1993). 5.) Hamuy and Phillips et. al, AJ,_112_(6)(2438-2447), Dec., (1996).